My older Chumby Classic is sitting on the main work table at at NYC Resistor in downtown Brooklyn where it streams music to the sound system. My new Chumby One is on my desk where it sits under my second monitor giving me ambient info during the day. I made a dedicated in-wall shelf for my Chumby One. 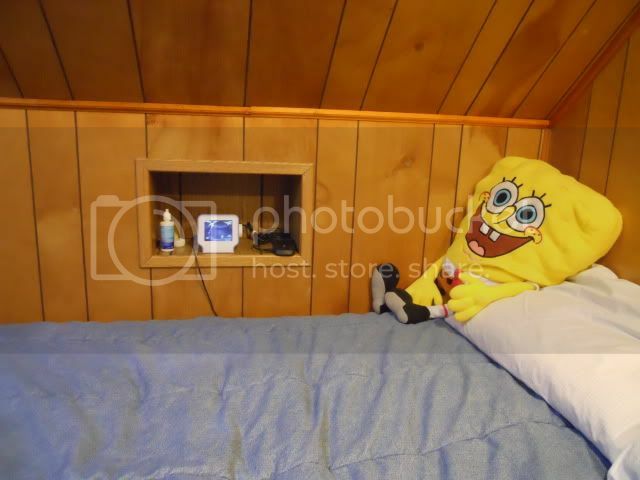 I use my Chumby next to my bed for listening to news in the morning, for weather, internet radio in the evening, and to stream my security cameras. I also use the usb port to charge my phone. Started out with one Chumby at home. Had vague plans of making it into an alarm clock: this was shortly after the general availability of the first rev hardware, and the early versions of the control panel didn't offer significantly better alarm options than my iHome ipod dock alarm clock. Debated trying to write my own from scratch using one of the Chumby ports of QT; decided there were probably more productive uses of my time. Chumby gathered dust for a year. I finally remembered to turn it back on: lo and behold, infinite custom alarms! Joy! I instantly dump my iHome. Two weeks later, there's a power glitch at 3am, and I find out the hard way that the first-rev Classics won't auto-restart after a power loss. Oops. So now I am the happy owner of two Chumbys: a Chumby One at home that's functioning brilliantly as a battery-backed alarm clock on my nightstand, and my Classic now sits on my desk at work, where it cycles through the facebook/flickr photos of my daughter that my girlfriend posts from home. Strongly considering buying a C1 for each of the grandmothers, but am biding my time to see if the long-rumored Chumbyized picture frames emerge at CES this year. I often take it down to toy with it - consequently, the FM antenna hugely gets in the way when I go to set it back down, I think I'm going to either put that back in the battery area or tape it down. The headphone/audio-out jack is really loose and the plug falls out a lot when I move it around, which is a minor annoyance since the cable isn't long enough to move it far anyway (I often unplug it when I'm playing with it). My first Chumby is in the living room, next to the TV and connected to the stereo to play internet radio. Most of the time it runs a channel that has various clocks, including my all-time favourite widget 'Sky Happenings', the weather, Picasa photos and a few novelty widgets that look OK from a distance, like the Lava Lamp. If I've got something on the stove, I'll change it over to the Toasty Timer channel. My new Chumby One is in the bedroom. I haven't completely sorted it out yet, but it plays a night time channel of darker widgets, like develephant's Moods: Snowflake and Moods: Star Warp and a morning channel of Google Calendar, Gmail, weather and a few news sites, liberally interspersed with the time. Mine is on my home-office desk hooked to my MS DSS80 USB digital speakers rocking out on Pandora (this could easily be built into the speakers)... next month I think I'll get one for my work office... love this thing...! Next to my bed on the nightstand. My Chumby (his name is Sammy BTW) replaced a traditional alarm clock radio. I wanted a internet music streaming radio for awhile (got a Slacker G2 already) with alarm functions but none of them impressed me as much as the Chumby since it can do so much for so little cost. I already want another one for the bathroom. Don't laugh, I spend a good 15 minutes in there every morning shaving, brushing teeth, getting dressed, etc... and having the news, weather, stocks, email scrolling by would be perfect. Mounted at eye level next to the mirror would be perfect. Next to my nightstand, then goes with me to work, then comes back home and is in the living room till night. I love the battery in the chumby one, for about 3-4 minutes in the car widgets work until it seems the wireless network is gone. I have hooked it up to my phone and it would work in my car but unless we get a google maps widget it wouldn't be too useful. I also need to get a car adapter to let it run more than a couple of hours off the battery. I listen to audio books (USB) at night on the timer. I get woken up by the World Service, with back up alarm. It then plays my info widget (weather, email, news, clock). Then I either turn it into a picture frame (using the picasa and flickr widgets), or my large channel (full of all the other widgets I enjoy). Saturdays I get woken up to the BBC R4 friday night comedy podcast, and Sunday, the BBC R4 Saturday live podcast. how did you set the email override? that sounds really useful. OK my original Chumby is in my office and my Chumby One is on my night stand. I used to move the Chumby around a bit but I also got a squeezebox for my stereo in the lounge room so all devices now stay put. My Classic sits in my living room. I mostly use it to keep an eye on email while watching the TV and to read newspaper articles and check the weather in the morning so it hardly ever moves from there, unless I want music while cooking. Another great side effect is that it has pushed my office back into my office. No more roaming laptops! Chumby One on my night stand with back-up battery. Fall asleep to Sleepsounds Wave Channel on a 40 minute timer. Awake to "White Stripes" Pandora Station then changes to Weather when I disable the alarm. Play CBS News video streams at night before going to bed. Ultimate clock radio! Near my side of the bed, on the nightstand, with backup battery too. It is used as an alarm clock, look at the weather, etc. It does not replace our "real old-fashioned" alarm clock so we have both: Chumby, sit at my nightstand and the "real alarm clock" at my wife's. Since it has a battery backup, I sometimes take it with me along the house but it stays 99 percent of the time in the nightstand. Got Pip posted bedside - he remains sentineled ready to move out 24/7 to kitch or B-room as he is battery equipped. I have two Chumboids, one each of the Insignia Infocast 8' and 3.5". The small one is under my monitors at work, displaying news and SocNet feeds while I work so I don't have to browse to them from the workstation. The big one is at home in my home office, where I use it to play music from streams and local flash media. On occasions when we entertain, I will move it to the kitchen or patio stereo for streaming duty. We have 3 chumby's, one is a Chumby 1, the other two are the Insignia ones from BestBuy. 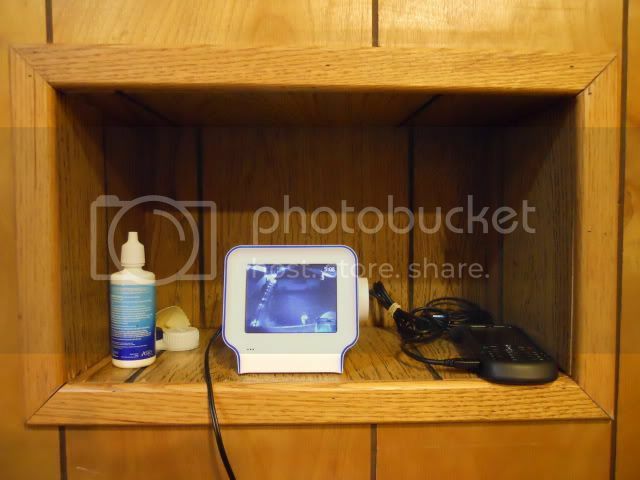 The Chumby 1 is in our family room on the side table and gets used the most. The other two are in the kids bedroom and are used as alarms clocks and playing their music before going to bed. I wish I could use the chumby at work but there are two thing, corporate WIFI certificates are not supported and the darn proxies! In the living room acting as a web radio/digital picture frame. I have a 8" infocast on my computer desk next to my 23" touchscreen all in one computer. and i had a 3.5" infocast on the otherside.. but i moved it to the bedroom for sleepsounds and to play games and look at facebook post while in bed. If the price goes down again i may get one for the kitchen and bathroom for music and such.